Free Printable Outer Space Crossword. Free Printable Outer Space Crossword, that you can use for home-school or science classroom. If you need a crossword puzzle about space or planets for your students, this Crossword can be a great alternative. 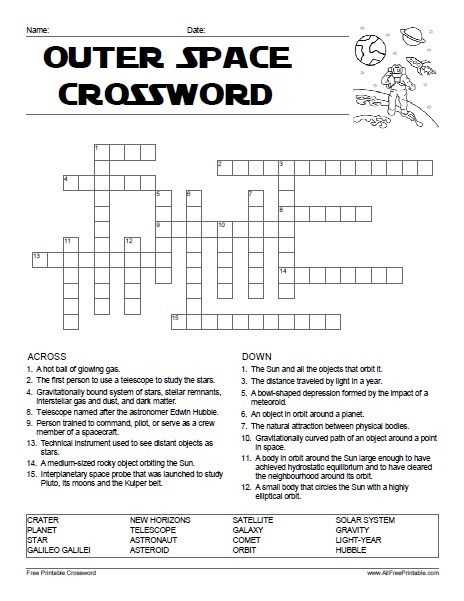 Kids that love all about space are going to have fun learning and solving this crossword. The crossword includes 16 words and names related to the Outer Space. Solve this crossword with words like Astronaut, Gravity, Hubble, Planet, Galileo Galilei, Orbit, Telescope, Star, New Horizons, Light-Year and more. Click the link below to download or print the Outer Space Crossword now in PDF format. Find the solution on 2nd page.